My policy on covers has almost always been to get something that would look awesome on my wall. I’ve developed five comic properties, and I’ve had eight or so covers come from them, and they’ve all shared a spot on the wall at some point or another. With Binturong, though, I wanted to do something I’d never done before. It’s fun to incorporate that pop-art ideal into your designs, but I really felt this demanded a totally different approach. I consulted with my better half, and asked for her design opinion. I wanted it to be thoughtful, and that was probably the only note I gave her. She came back with a really classy design of the protagonist looking up at the stars, searching for purpose. And just out of his field of vision hangs The Binturong, waiting for him to realize it. Loved that idea, loved that design, and sent it over to the incomparable Nic Giacondino. He’s got a knack for that industrial, cool, lived-in aesthetic that Binturong inhabits, but I was really psyched to see what he would do with this design. What I got back was so simple yet powerful, and I loved it. We then sent it over to Pedro Figue for coloring, and he sent back three different color choices, this being the final option. There’s so much to love about the colors here; it helps build that sense of isolation for our protagonist. He’s in an unfamiliar place, completely alone, looking to the sky for answers, and that alien sky and sunburned land just works so well. Obviously I had a really strong reaction to this option, so here we are. 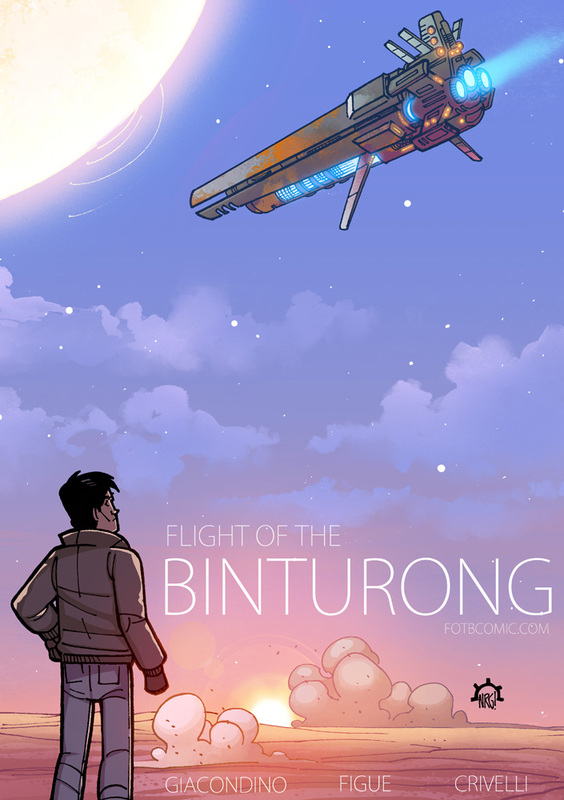 Flight of the Binturong has taken about a year to develop, and I’m so proud of the work you’re about to see. I want to extend a tremendous thank you to my collaborators Nicolas Giacondino (Free Mars and Divinity), and Pedro Figue. On the web development side, we wouldn’t have a site without Tiffany Zuber, who designed the site and built all the graphics you’ll see here. Finally, big thanks to Danielle Lyons, who coded everything and makes the whole site function. I encourage you to explore the site, visit our Facebook and Google+ pages, drop by the Tumblr for extra insights about the development of Flight of the Binturong, and discover the world for yourself. And of course, be sure to stop by every Tuesday for a new page in the unfolding epic of our little band of space mechanics. I like the comic but I read the title as ‘Flight of the Batarang’. This is too exciting! Sweet cover art. Can’t wait to read it. Awesome!!! I can’t tell you how excited I am for this comic, there aren’t too many space comics out there as it is and there are even fewer that have such awesome looking art! I can’t wait to read this! Gah! When will it be Tuesday and when can I get a binturong for my ship? Yay! So glad you’re excited about the comic. I am too! I’m also really jazzed to read your story! I’ve read a few things that you’ve done before and you always tell a really great tale! I’ve been a huge fan of Garth Kirby, so I’m really looking forward to this new comic as well! Site looks great too!